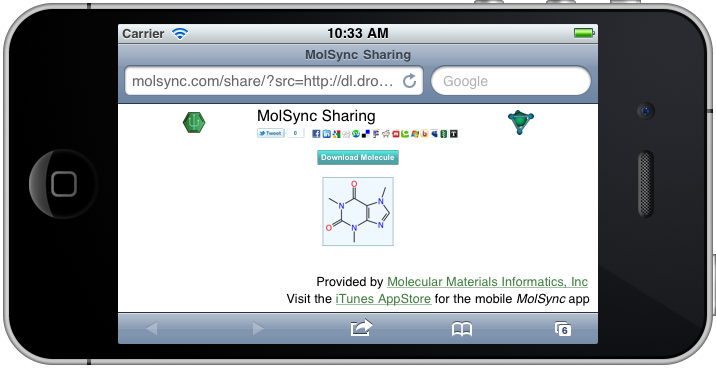 Sharing a molecule from the public folder. A public molecule, ready for sharing. If you are a user of Dropbox, you may know that each account has a special folder – /Public – which makes its contents available to anyone for downloading, as long as they formulate the URL correctly. MolSync takes advantage of this feature when you select the Open in Browser menu item, by combining it with an experimental feature provided by the molsync.com website, which has some complex and fairly convoluted machinery to present your data on the web. Each of these links display some kind of chemical data. 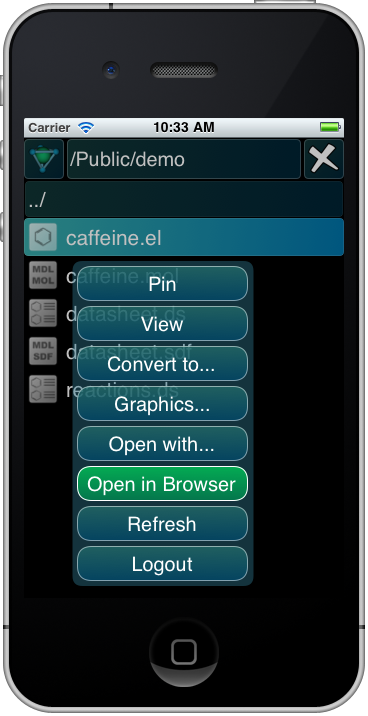 If you click on them all, you will notice that caffeine.el and caffeine.mol are the same, because they are both molecule formats, as are datasheet.ds and datasheet.sdf, which are both datasheet formats, representing the same chemical content. One of the key points here is that each of the molecule images is a vector graphic, not a bitmap. That means if you zoom in the page to any resolution, it does not get grainy or blurry; similarly if you decide to print the page or turn it into a PDF, it retains its sharpness. In the above examples, the dialog box is offering to let you download a collection of reactions, in any available format. The list of formats varies depending on the data. In this case, there are two cheminformatics formats: DataSheet XML, which is the native format of MMDS and any other software produced by Molecular Materials Informatics, and MDL RDF is the industry standard format for sharing collections of reaction data. Three graphics formats are available: ZIP files: either with PNG or SVG content, one file for each graphical object, in this case reactions, and HTML, with graphical objects represented as embedded SVG diagrams. 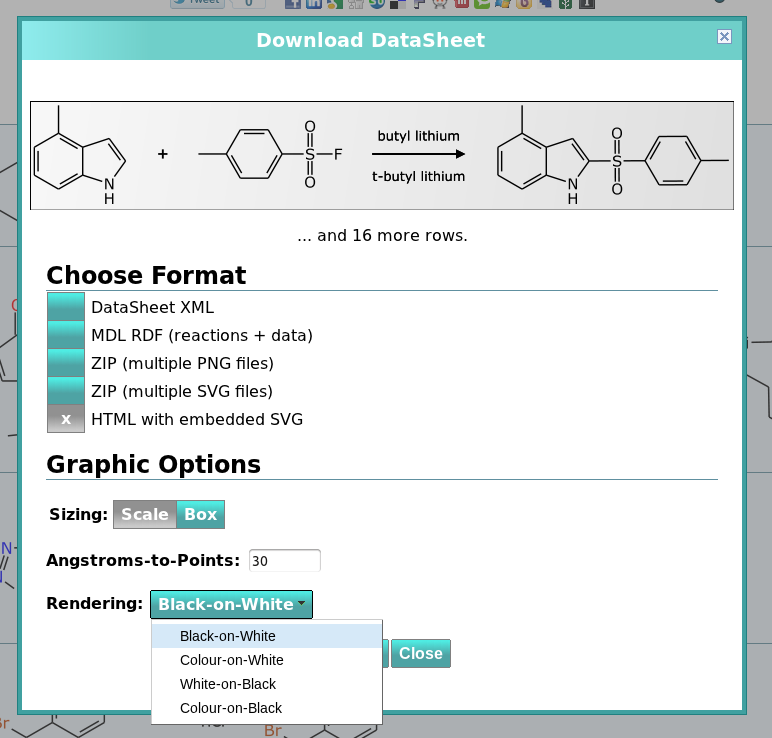 When downloading content for individual molecules or reactions, the graphics options are more straightforward, e.g. a single PNG or SVG file. 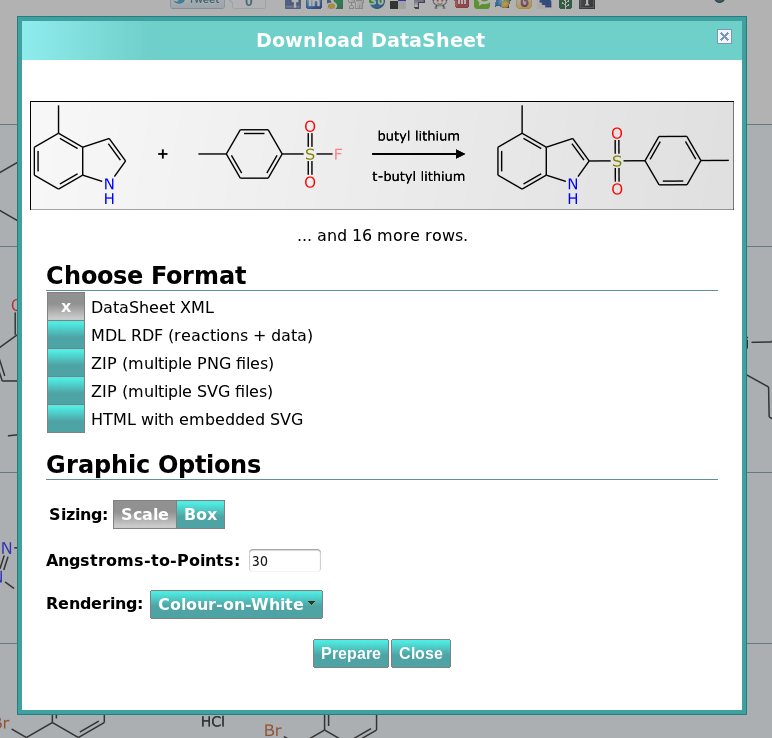 Downloading source data in a cheminformatics format will perform the conversion on the fly. The same applies to graphics, which means there is an opportunity for you – the downloader – to decide on parameters for rendering the graphics. You can choose the colour scheme, rather than having it chosen for you, which tends to vary depending on the objective, e.g. preparing graphics for a website often looks better in colour; preparing graphics for a published manuscript is usually done in black’n’white; or, if you want to put a molecule diagram on a PowerPoint slide that has a dark background, white-on-black or colour-on-black is the way to go. While for SVG graphics the resolution does not particularly matter, since vector graphics are resizable, the pixel count is critical for generating bitmapped PNG output. For generating graphics for web placement, the lowest possible resolution should be used, to save on bandwidth, and to account for the fact that a lot of web browsers use a terrible resizing algorithm. For publishing bitmapped graphics, you need to crank up the resolution to something equivalent to at least 300 dpi, otherwise your manuscript will look bad when it rolls off the press. These are the social media sharing buttons. Since the URL is fixed – as long as you leave the original content in the same place on your Dropbox public folder – it is appropriate to share the URL with whomever you wish, so tweeting, facebooking, etc., is all fair game.